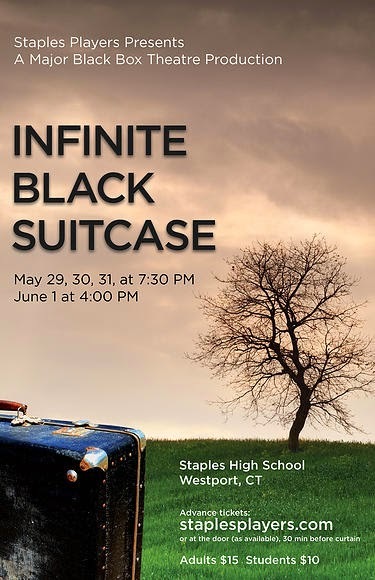 "Infinite Black Suitcase" interview featured in Samuel French's "Breaking Character"
I had a wonderful conversation earlier this year with David Roth, the director and theater teacher at Staples High School in Westport, Connecticut. He was planning to produce my play "Infinite Black Suitcase" with his fabulous troupe of student actors, the Staples Players. 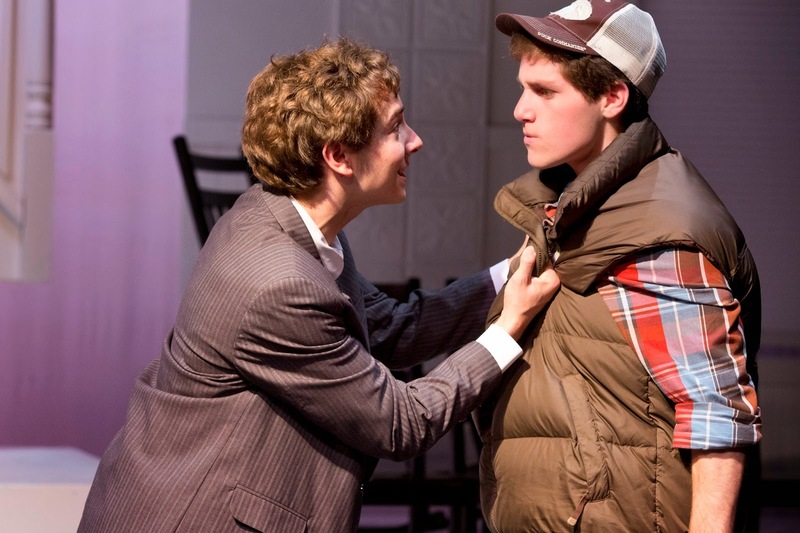 He and his actors had some questions for me about the play, and our correspondence has ended up (with the permission of both parties) being featured on the Samuel French website, in their online magazine "Breaking Character." Check out the feature article HERE. I wish I could have seen the Staples Players production. 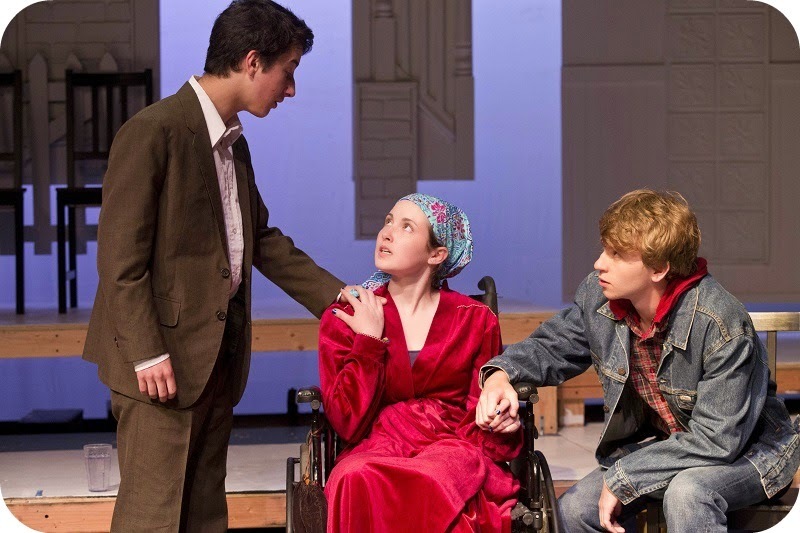 From all reports and photographs, these young actors did an amazing job with the play! More about Staples Players and their production HERE. To buy a copy of the play from the Samuel French website, or to make production inquiries, click here! "Song of Extinction" was presented on November 20, 2014 at Lafayette College. The play was part of a series of events at the Williams Center for the Arts called "Requiem, Ectopistes Migratorius" that marks the centennial of the extinction of the passenger pigeon. 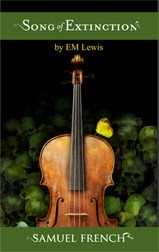 Finalist for the Shakespeare's Sister Fellowship from AROHO! I am honored to be a finalist for the Shakespeare's Sister Fellowship from the A Room of Her Own (AROHO) Foundation, alongside Katie Bender from Austin, TX; Ellen K. Graham from Denver, CO; and Stefanie Zadravec from Brooklyn, NY. The award has been given to my talented colleague Dipika Guha, who receives a $10,000 prize as well as institutional support from three organizations that give tremendous support to playwrights in this country -- The Lark, Hedgebrook, and AROHO. Congratulations, Dipika! Thank you, AROHO, for giving such practical support to women playwrights. For more information on the fellowship, visit the AROHO Foundation website. The west coast premiere of THE GUN SHOW opens tomorrow for a six week run in Los Angeles, at my old home theater company, Moving Arts. The show is directed by Darin Anthony, and produced by Cece Tio. It stars Chuma Gault. Hope you can make it out to see the show, Los Angeles friends! More information and tickets available at www.movingarts.org. 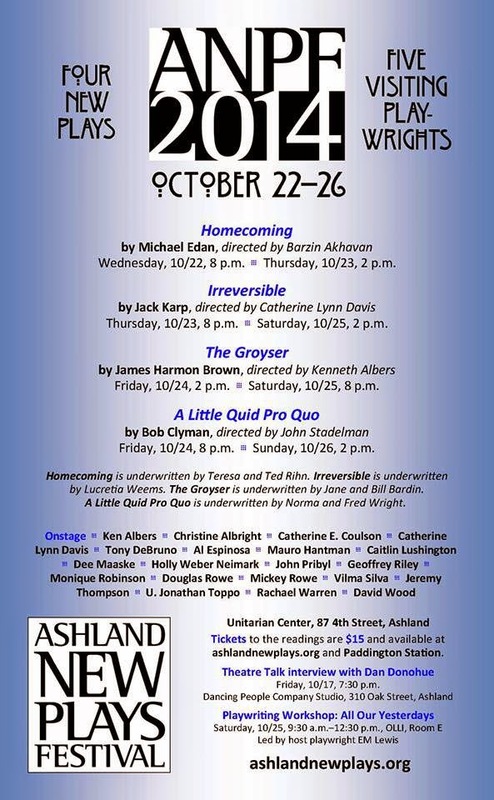 I was delighted to be back in beautiful Ashland in late October for my fifth year as host playwright at the Ashland New Plays Festival. I saw lots of old friends, and was able to welcome the four winning playwrights to town, moderate their talk-backs with the smart and articulate ANPF audiences, and teach a playwriting workshop entitled "All Our Histories." They've asked me to come back again next year, and I couldn't resist saying yes. See you then, friends! Submit a play to them, friends! I love these folks, and they are fabulous at celebrating new plays and the people who write them. ANPF 2014! Artistic Director Doug Rowe, me, and our four winning playwrights: Bob Clyman, James Harmon Brown, Jack Karp, and Michael Edan. I caught two plays at the Oregon Shakespeare Festival while I was in Ashland, and really enjoyed them both. The Great Society (about Lyndon Johnson's second term as president of the USA) was fascinating, and made me sorry I'd missed the first installment, All the Way. I'm hoping to go up to Seattle later this winter, where they're both going to be playing in rep. 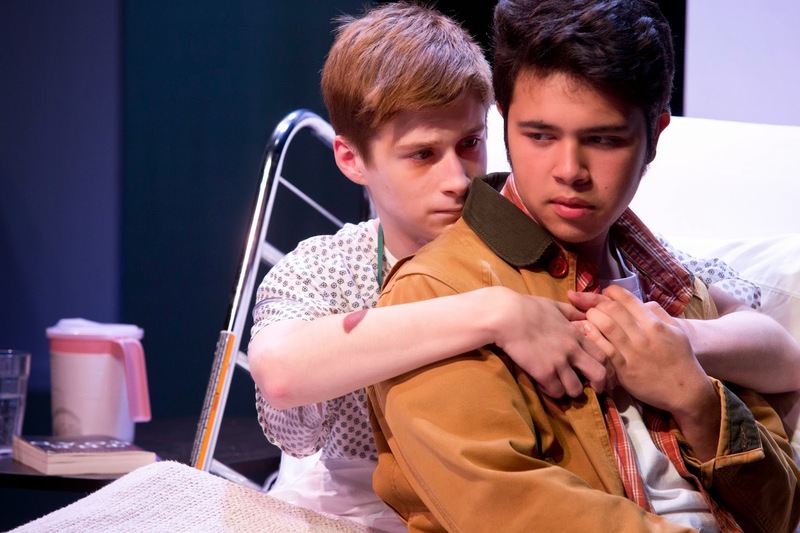 The other play I saw was an adaptation of A Wrinkle in Time. This is a favorite, favorite, favorite childhood book for me, so it would be impossible for them to live up to my expectations... but they did a pretty darn good job! It was very theatrical, and used a lot of the simple theater magic that I love so much.